Download the dashboard strategies report today. Make your case for marketing’s real contribution. Marketing dashboards can be real standouts or agonizing exercises in futility. 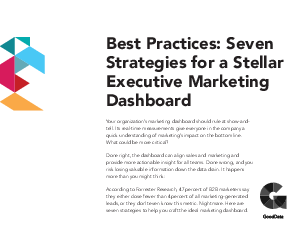 Avoid the typical missteps that hold companies back with 7 strategies that raise marketing dashboards above the crowd and help demonstrate marketing’s real contribution to revenue. Stop guessing—Dynamic dashboards let you create accurate reports on your own. Come together—A single source of information nurtures collaboration and innovation. Distracted by details?—Big-picture views focus on metrics that really matter.